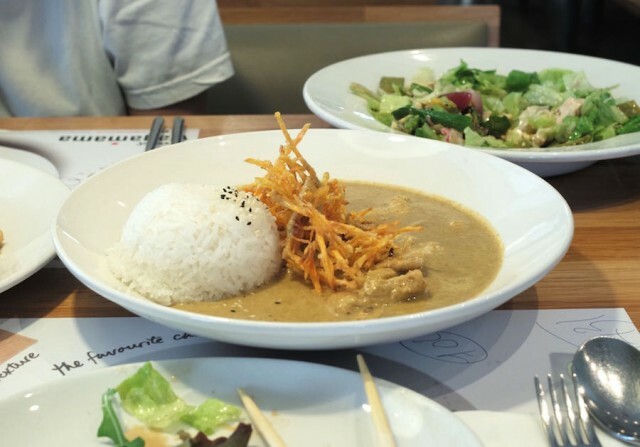 I wasn’t going to review Wagamama as I thought I wouldn’t add much value given that it is a chain restaurant and such a well-known one as well. I couldn’t, however, not write about my last visit a couple of weeks ago in Nicosia. It was the first time I ordered something other than the udon noodles and was surprisingly impressed and honestly, quite happy. Even the very picky, and very hard to satisfy proud Cypriot mother liked it! I would categorise it in the pan Asian section as it offers, Thai food but also sushi and some other Japanese dishes. I do like the fact that it is casual and quick as I would mostly go for a lunch break and not for a long dinner with friends. I was actually not at all surprised to find it full during lunchtime on a Tuesday with mostly working people on their lunch break, tourists (yes, true! ), and even families with young kids (indeed, on a Tuesday!). For those of you who have never been I find it necessary to let you know about the super fast ordering and serving system. Food comes as it’s ready and the option of co-sharing benches (something us Cypriots don’t do very often) is available. Given what I do, I like trying out new dishes every time I go to a place. I am still trying, however, to understand why for the past 10 years (including when I was living in London), I have been ordering the same dish: the udon noodles (Teppan) with different combinations. It must be because I liked it so much that I thought I’d be missing out if I didn’t order that particular dish. Well this time, being 9 months pregnant I thought I ‘d try something different, less spicy and more refreshing. The orange and sesame chicken salad with coriander, mangetout onions and cashew nuts was a great dish for a summer day. It was refreshing and finally a salad that used a more interesting combo of ingredients than just lettuce and balsamic vinegar. Although I am not a fan of fruit in my food the orange gave it a nice, sour touch while the sesame dressing made it more interesting. 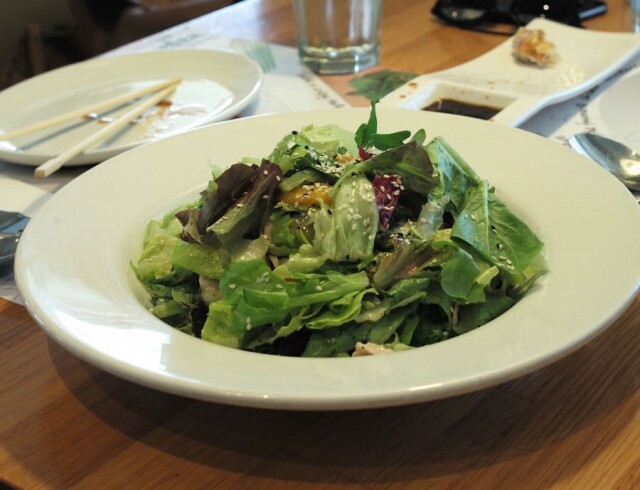 Needless to say the salad portion was large enough to satisfy a hungry eater. Although we were in between the dumplings and the whole baby crabs, a quite tempting, new dish on the menu, we opted for the dumplings after the proud Cypriot mother’s request. 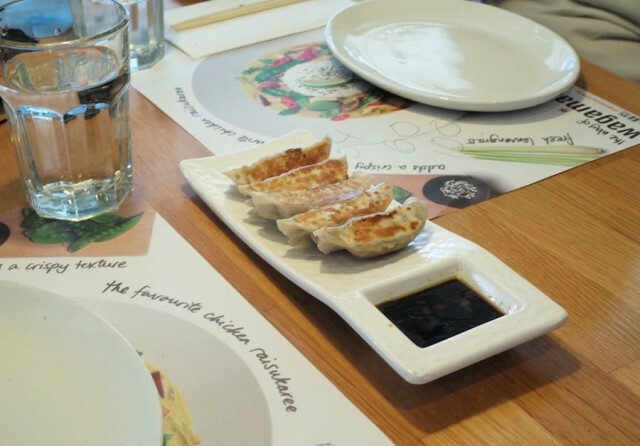 The “gyoza” dumplings that were deep-fried and filled with chicken and vegetables and were served as soon as they came out of the pan. These were surprisingly good, and I say “surprisingly” because it was an improvement since last time I had them. 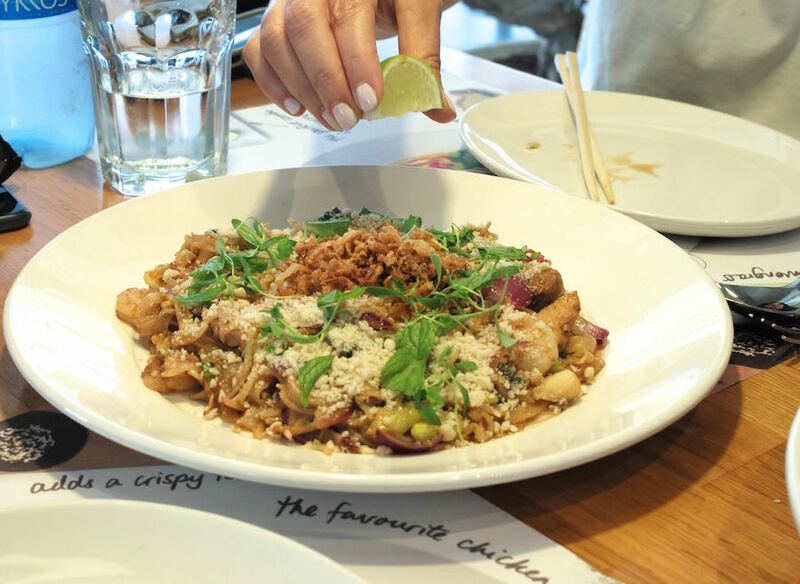 The Wagamama pad thai with chicken and prawns, with beansprouts, leeks, onions, chives, ginger, peanuts and extra lime was a proper pad thai, a dish that I absolutely love. The sour taste of lime contradicted the sweet flavour of the amai sauce, something that we liked. I can’t wait to try a new dish on the menu, the “yasai” pad thai next time. Finally the surendra curry chicken was a great change to the chicken Katsu curry everyone orders. It was lightly spicy and a good curry dish if you are a fan. In hindsight I should have tried the white chocolate ginger cheesecake or at least the white chocolate and rasberry brulee. Why not go all-in in my last week of pregnancy? God knows. 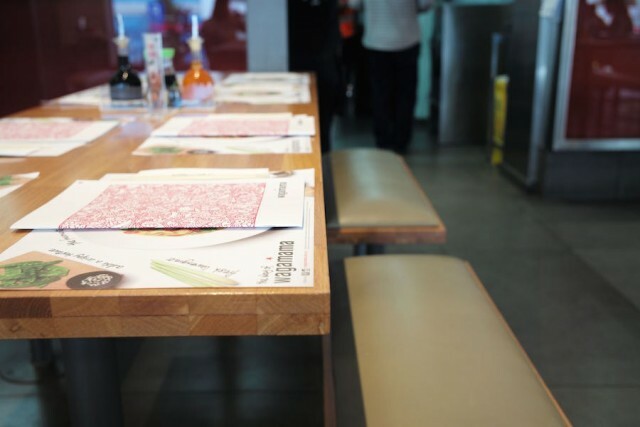 Having experienced a different Wagamama, the Wagamama that has a light salad option, the Wagamama with a good pad Thai, I am definitely going again to also try “Wagamama- the sushi place” that I heard is also good.